The Upward Lightning Triggering Study (UPLIGHTS) is a three year National Science Foundation funded research campaign seeking to better understand how upward lightning from tall objects is triggered by nearby flash activity. 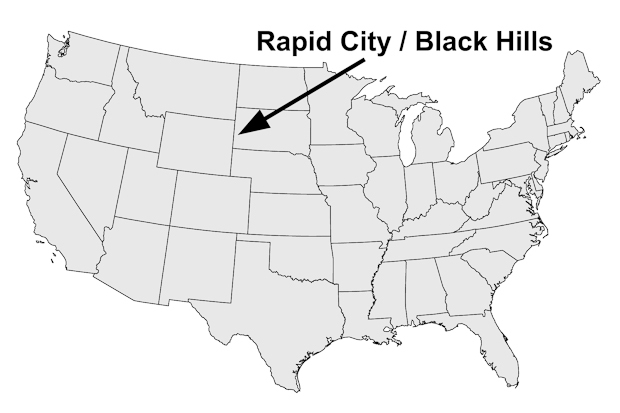 Using coordinated optical and electromagnetic sensors, researchers from the South Dakota School of Mines and Technology and INPE Brazil will observe upward lightning from 10 tall towers in Rapid City, South Dakota, USA during the 2012-2014 summer thunderstorm seasons. Upward lightning initiates from a tall object and propagates upward toward the overlying clouds. The presence of the tall object causes enhancement in the electric field enabling the generation of an upward leader. Without the tall object, an upward leader would not develop. Upward lightning was first studied in the 1930s when upward flashes from the Empire State Building in New York City were observed with Boys cameras and current sensing instrumentation. Below are map images showing the location of the research project. 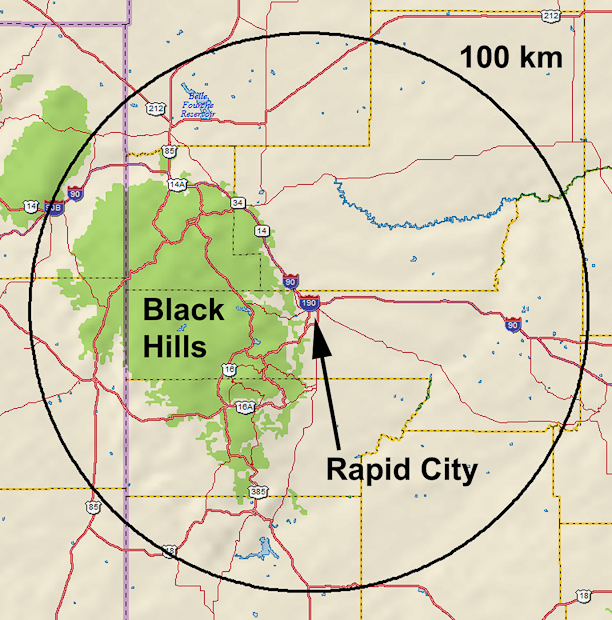 Three are 10 towers located on a ridge that runs north-south through Rapid City. 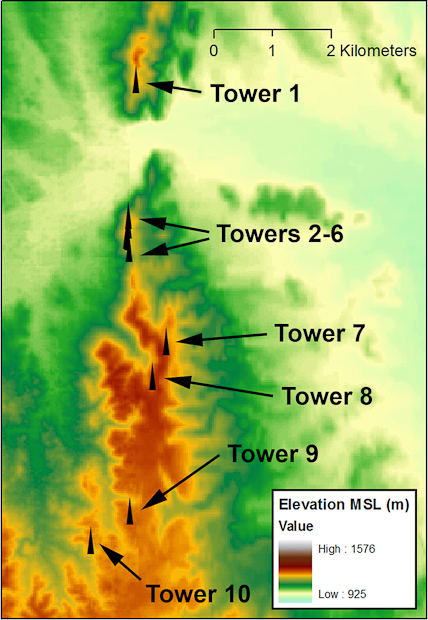 Below is a digital elevation map showing the tower locations. Here is a view of the northern six towers as seen from a primary observation location. View is looking northeast. 1) Types of flashes (intracloud or cloud-to-ground) and their properties (polarity, current, electrical potential, distance from tall objects and propagation speed) that affect or are critical for the initiation of upward leaders from tall towers. 2) Types of storms (e.g., mesoscale convective systems, supercell, multicell), region of storm (e.g., anvil region, convective core, trailing stratiform precipitation area), and storm development stage (e.g., mature, dissipating) during which upward lightning occurs. 3) Conditions for triggering upward leaders on multiple tall objects during the same flash: all upward leaders initiated by one influencing component of a triggering flash or as a result of interaction between individual upward leaders in a sequential manner. 1) Opticial sensing: multiple high-speed cameras capable for recording rates over 100,000 images per second, standard- and high-definition video cameras, and digitial still image cameras. 2) Electromagnetic sensing: two interferometers that can 3-dimensionally locate radiated sources from lightning leader propagation, electric field meters, fast and slow field change sensors, and National Lightning Detection Network data. Interferometers will be loaned from Vaisala, Inc.
3) Meterological: radara data from the KUDX WSR-88D weather radar located near New Underwood, South Dakota, thermodynamic sounding data obtained from and by the Rapid City NWSFO, and meteorogical surface data observed at the Rapid City NWSFO and Rapid City Regional Airport. This research is made possible be a grant from the National Science Foundation.